It’s been a topic of modest conversation ever since Steven Gerrard was made manager last May, almost a year ago now. That getting such a huge name as boss would automatically attract the best players to Rangers, just like back in the day and Graeme Souness’ ability to attract world class English players and even the shock signing of Maurice Johnston. Sure, Souness had the ‘benefit’ of English clubs’ suspension from Europe following the Heysel Disaster, but these players could have gone to the continent (as some did initially, look at Hateley and Wilkins). But they chose Rangers. Steven Gerrard, let’s face it, has not had the same luck. Yes, it’s a different world now to the late 80s and it’s very hard to validly compare, but the hard reality is Gerrard didn’t really get one big marquee signing in either window. Some will point to Steven Davis and Jermain Defoe, and they’d have certain points – but both were completely surplus at their current clubs, both are aging dramatically and both have been little more than fringe players at Ibrox. Otherwise, Gerrard’s signings have been either been solid, or decent, or awful. It’s been your Connor Goldsons, your Scott Arfields, and your Umar Sadiqs. But it’s the absence of that expected big name, that ‘Joey Barton’ sized signing which has been the most surprising. Yes, we don’t have a colossal budget and can’t even compete with the Championship in England half the time, but the name of Rangers and certainly Steven Gerrard carries a major amount of weight. 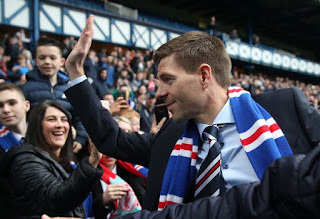 Indeed, the best two signings Gerrard made weren’t even by him, but were made with his blessing – Allan McGregor and Arfield remain the best two acquisitions in this era, and were confirmed around the time Stevie got the job. And we’d have to say McGregor does count probably as the ‘marquee’ signing, a truly borderline world class goalkeeper who elevates Rangers. But obviously he’s one of our own and we held a bit of an advantage in getting him (back). But otherwise that big-name, that big star signing we assumed would come flocking to Ibrox when Gerrard got the job really hasn’t materialised – Defoe is the closest but it was hard to have stunning hopes over a 37-year old. It would be nice if we could get someone with a real pedigree this summer, someone exciting – a seismic signing to really scare the SPL. Time will tell if that materialises. I dont know about scaring the Spl but reading this article scares me. Football has moved on, Rangers will never sign a player of genuine pedigree again. Those days are over. The sooner people realise that the better. This spending money the club doesn't have is completely irresponsible. What about our injury problems? Joey Barton was never a big signing as he proved when he pulled on that blue jersey. He was a distinctly average player who floated around the Championship or the lower end of the EPL. I'm afraid where we are now that Defoe and Davis ARE the marquee signings. Gerrard may have good contacts but top players are not going to give up top salaries to come and play in the SPL. The best we can hope for is someone at the end of their playing days looking for one last hurrah or players trying to resurrect their career by moving out to get some game time. Sad but true. Money counts and, sadly for the fans, Rangers don't have any. In this day and age the Gers just can't compete. The scouts need to be searching the lower league's for up and coming players. There is no other option.